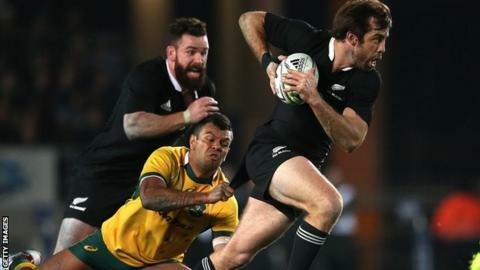 New Zealand claimed a record 51-20 victory over Rugby Championship rivals Australia to retain the Bledisloe Cup. After a 12-12 draw in Sydney last week, the All Blacks scored six tries in Auckland to leave the Wallabies without a win in New Zealand since 2001. In the other match Argentina came within five minutes of securing a first-ever win over South Africa. Both sides scored three tries in Salta but Morne Steyn's late penalty clinched a 33-31 victory for the Springboks. In Saturday's first match, two tries from All Blacks captain Richie McCaw in Auckland were added to by scores from Julian Savea, Kieran Read and Steven Luatua. The home side were also awarded a penalty try, while fly-half Aaron Cruden kicked 19 points. The All Blacks led 23-6 at the break before three tries in 10 second-half minutes killed off the match and helped the home side eclipse the 50-21 win over the Wallabies in 2003. Israel Folau and Australia captain Michael Hooper scored two quick consolation tries to reduce the deficit but replacement flanker Luatua crossed for a last-minute try that scrum-half Aaron Smith converted. In the second match Argentina and South Africa each crossed once in the first half, with winger Manuel Montero scoring for the Pumas and opposite number Bryan Habana for South Africa as the visitors led 16-13. Tries from scrum-half Tomas Cubelli and full-back Joaquin Tuculet put the Pumas in charge but right wing Cornal Hendricks gave the Boks the lead again. And although a booming Marcelo Bosch penalty from inside his own half put the Pumas ahead with less than 10 minutes to play, the reliable boot of Steyn secured victory for the Boks.